This is the detailed plan for The Green Factory Nijmegen. For this plan I chose for an area located in the South. In the Masterplan this is referred to as The Restaurant. For my design I had something different in mind. The Identity map and Industrial map both show that there is a lot of industry on the West-side. This industrial terrain contains the following; metal companies, garbage disposals, and car repair shops. The purple splotch in the North is now a closed coal-plant. On the Uniqueness map you can see that there are a few parks and recreation sites nearby, so that means that the site has to some nearby competition. The concept is to spread the idea of sustainable food-production in a social setting. 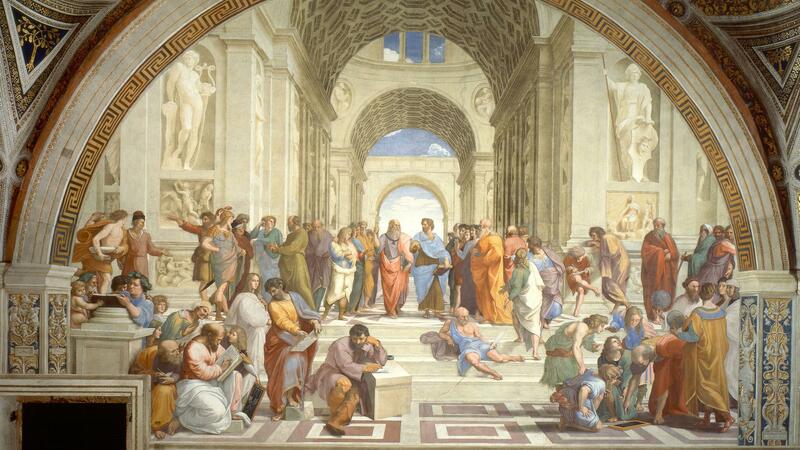 The setting will be like in the painting School of Athens. A place where people come and share ideas, but instead of the ideas being metaphysical it will be more like in the Islamic Golden age. In this age the ideas were more specific and scientific, like the discovery of the Arabic numerals, Alcohol, Algebra and naming 2/3 of the stars that we see at night. The centre point of the design is the Foodlab. At the Foodlab people can experiment with different ways of food-production, whereby mechanization and doing more with less is a key element. The Lab is a science centre where nearby schools or kids from the neighborhood come to learn hands on what it means to produce crops, while using the latest technology. When children have a garden to look after they score 15 points higher (on a scale of 1 to 100) in the subjects math, engineering, and science (As explained by Kimbal Musk). When The Foodlab gets well known, it has the potential to grow further into the city. An important factor is that there will be no export of goods, unless the area around the Foodlab has an abundance of food. The industrial terrain in the East will undergo change in the next 10-15 years. A lot of car repair shops will disappear, since car companies are going to shift their focus to cars without ownership. It will result in less repair shops, quicker repairs (due to smarter design) and less cars. These places that open up will gave space for the Foodlab to expand. When the City eventually becomes self-sustaining because of the enormous growth of the Lab, it can export their abundance of crops to other cities to expand even more. This will have to be through the ways of Corporate Social Responsibility. This design fuses the idea of Jane Jacobs that cities became big because they exported more than they imported, and the idea of A. Naqvi that cities not countries, are the key to tomorrows economies. Aquaponics is a far superior way to grow food in a sustainable manner , the right one is my own system. The pictures are made 4 weeks apart. The Voronoi Diagram is used for this design. I was looking for a way to make the appearance and entrance to the Foodlab a surprise. The solution for this is was on the terrain all along. I had a lot of soil left when excavating for the parking-lots and (bicycle-)paths. I placed this in front of the Foodlab to create a barrier which constitutes to the experience for a surprise. For the building I used the same voronoi diagram with the help of Voronax. It creates the optimal geometry between points through the same proces as nature while forming bubbles.